Product information "AuRACLE® AGT-3 - Gold & platinum tester"
test results shown in seconds - without waiting! GemOros advanced digital AuRACLE® AGT-3 is the ultimate verification instrument for gold and platinum testing. This state-of-the-art portable handheld tester has exceptional precision, is simple to use and in only seconds provides accurate test results. 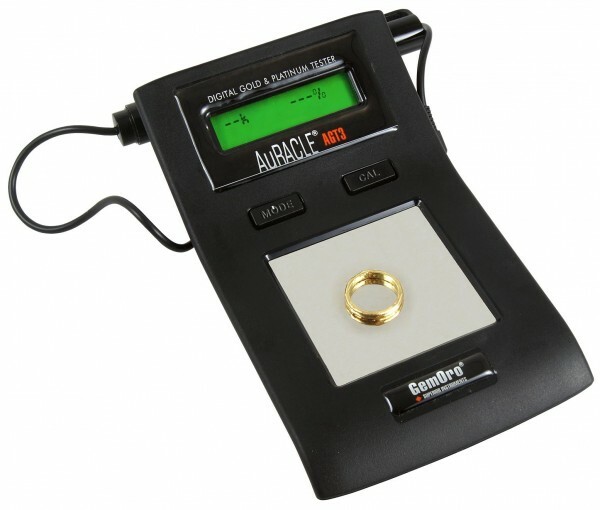 follow easy steps to identify non-gold, gold plate and gold filled as "N/A"
Related links to "AuRACLE® AGT-3 - Gold & platinum tester"
Instruction manual for Goldanalytix AuRACLE® AGT-3 - Gold & platinum tester as PDF file. Customer evaluation for "AuRACLE® AGT-3 - Gold & platinum tester"